5 days old already, gaining nicely,pigment coming in beautifully. Alexa is the proud mama of her babies with good reason. They are nice strong little babies and even the little girl is doing well. The puppies are content and love to cuddle up together. Alexa's puppies 3 days old! Here they are in the order of birth. The first born boy was born with pigment as you can tell it is coming in nicely. 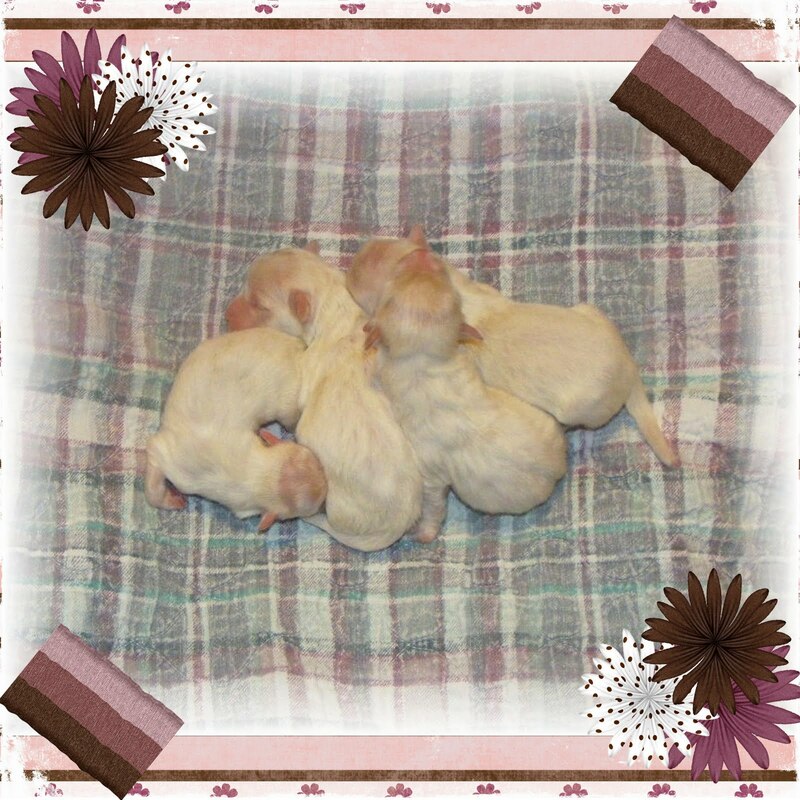 All of the puppies should have beautiful pigment, I am looking forward to watching these little ones grow. This is Samson's second litter sired and he is the sire of Candy's upcoming litter as well. After taking about 1oo pics this is the best I could do. I was in a hurry as Alexa wants them near her and they were crying for their mama. All are doing fabulous, even the little tiny girl, she is gaining nicely. The first born, the little boy was born with pigment. They are all white and just precious as ever!!! We welcomed 3 beautiful white boys and 1 tiny little girl into the world yesterday morning. Alexa was in pre labor Wednesday night and Thursday morning delivered 4 puppies in just over an hour! Mom and babies are doing fantastic, first 2 boys weighed in at 5 ozs the little girl at 3.5 ozs and the 3rd boy at 6 ozs. I hope to have pictures this evening, I didn't want to disturb Alexa by taking pictures yesterday. The puppies are quite content nursing and sleeping. The puppy stork is all set to arrive this week, and Alexa is ready!!! We are expecting the puppy stork to make his appearance this week. Cotton Blossoms Candy Kisses a mother to be!!!! Candy Kisses, she lives up to her name!!! She is our baby girl, has the sweetest of dispositions, her role in life is to give kisses to all 2 legged and 4 legged! She is expecting puppies approx August 14th, her belly has started to grow, and so has her appetite! Our Jazzy girl as we call her. Such a sweet gentle girl. She is mother hen here at Cotton Blossoms, all my younger girls just LOVE Jasmine and are always trying to get some of her attention. Kayla was our very first keeper, what you see in the pictures is just how she is, the biggest smile imagineable!!!! We think if she could she would talk, and I do not mean barking. She has all sorts of sounds she makes and I swear sometimes she says mama. She is the mother to our Candy Kisses, and will soon be a grandmother as Candy is expecting puppies mid August. Chloe was our very first Coton De Tulear, she will be 9 in August and still looking good as ever. She is an absolute dollbaby. She is the mother to our Sassy and grandmother to Carly. She is definitely a very special little girl, and she knows it!! Cotton Blossoms A Royal Gem AKA JADE!!! Jade after her bath, she has the head tilt down pat. She was born here at Cotton Blossoms the daughter of Madison and Jasmine. Also, she is the mother of Macey (OPAL) & Zoe (Pearl). What beautiful girls she had, I am sure they will grow up to follow in their mother's footsteps. Cotton Blossoms Sugar N Spice AKA SASSY!!! Yes, it was bath day today for Sassy, I hope you enjoy her photo shoot. She is the mother of our Carly and is just as sweet as sweet can be. Cotton Blossoms Easy on the Eye AKA Carly!